Still bouncing off my summer buzz of everything USA—Team USA, 4th of July, vacas to Vermont, Newport and Colorado, and a recent bike ride over the bridge and into Billyburg for spectacular soul food at Pies ‘n’ Thighs—I decided to co-host a polka-dot themed girl’s night with my Tribe. Using Nini’s apartment and my fervor for all things Americana to guide our menu, we decided to focus on desserts and do a Sweets Only Soiree for the ladies in our lives. But who wants a heavy confection in this heat? I’d have to come up with something cool, something spiked and something seasonal to keep our menu, mouths and bikini bods in check. What’s more American than milkshakes and apple pie? Nothing. Shakes and pies should get a shout-out in our national anthem; they are the ultimate in sweet tooth satisfying seductions within our shores. Howevs, and alas, apples are not in season, so last week I went searching for a suitable seasonal substitute. My recyclable tote in tow, I made my way through the hordes of sun-kissed shoppers at the Union Square Farmers’ Market, determined not to be led astray by the much anticipated arrivals of sweet corn, budding squash, and scrumptious heirloom tomatoes that threatened to distract me from my mission. With the heat beating down and my focus waning and wandering toward anything air-conditioned, I suddenly spotted the most mouth-watering blueberries I’ve seen this side of the Mississippi. Just then, a breeze rushed over me as if the berries themselves were cooling me off from the summer warmth. Flashing shades of deep blue and violet, the morning dew still reflecting off their skin, I was sold. The season has just got under way for these berries that burst with pungent yet sweet, refreshing savor. Doctors say the little guys help fight some cancers, defend against macular degeneration and also help keep your gums and teeth healthy. A powerhouse of antioxidants and vitamin C, the pigments in blueberries also help support your vascular system…so goodbye spider veins, hello bikini bods! But doctors don’t know from taste, and I say, as with all real foods, blueberries are as delicious as they are nutritious and ought to be celebrated as much for their flavor as for their function. Yes, blueberries explode with nutrients, but at their seasonal peak, it’s their taste that stops you in your tracks. Born and raised in North America and typically grown in woods and mountainous regions, blueberries grow wild, and their bushes can sometimes be found flourishing on the side of the road! With over 30 different types of blueberries there is wide variety to choose from. 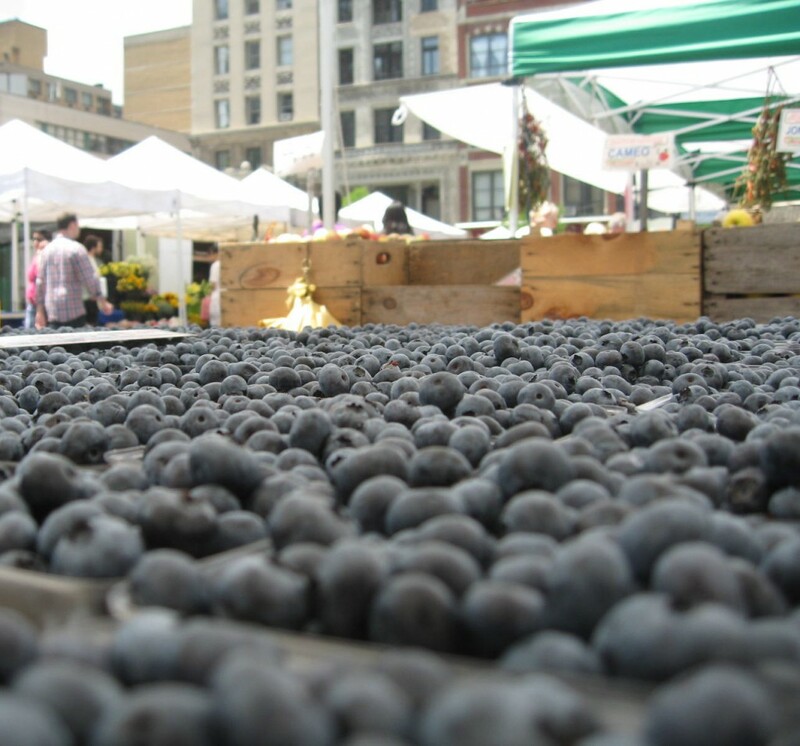 At Union Square, I found a number of berry varietals; among the most popular were Vaccinium Casesariense, a New Jersey blueberry, and Vaccinium Boreale, planted and picked in Southern New York and Massachusetts. Depending on climate, the berries are picked mid June till mid-to-late August, so the time is now to bathe yourself in the calming luxury of blueberry nights. Obviously, blueberries and pie go together like shin guards and cleats. 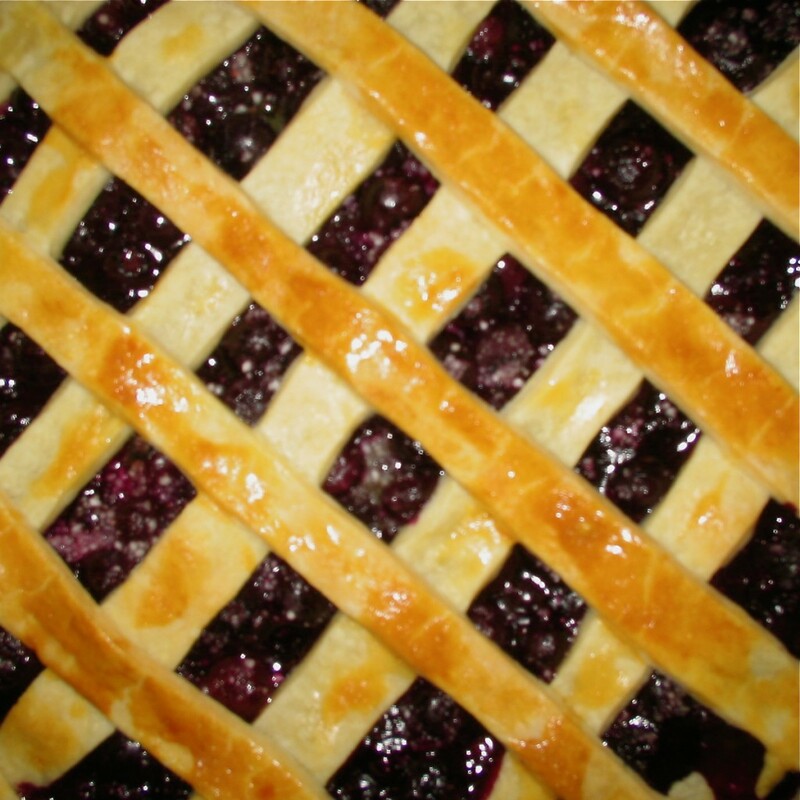 Once home, I opted to make a blueberry pie with a candied ginger twist. As I was making the filling, I came across a jar of blueberry-ginger jam, also purchased at the farmers’ market, and could not resist adding it to the mix. It helped thicken my filling and added a spicy-sweet tang to the berrilicious pie. But I didn’t stop there, instead of milkshakes, I make two varieties of smoothie: a vanilla greek yogurt concoction sprinkled with whole blueberries for a surprise berry burst in the mouth, and a blueberry-banana acai blend made from frozen acai sorbet mixed with fresh fruits and apple juice. The shakes were the perfect balance to the pie…entirely satisfying, but not overly sweet or heavy for my summer shindig. With the leftovers, I experimented with all things blueberry while I was weekending at the beach. A house-guest who cooks is always a welcome addition to a weekend getaway, and last weekend I was welcomed out to the Hamptons, where I treated my clamming hosts to blueberry pancakes, fresh fruit salads spiked Grand Marnier and sprinkled with Vaccinium Boreale, and blueberry muffins. Before the season is over, I vow to gift them a jar of blueberry jam; a sweet reminder of our summer adventures in the clam beds. Prepare the pie dough from the recipe above and line a pie plate with dough. Mix together ½ cup sugar, cornstarch, lemon juice, lemon zest and the small jar of jam. Place the blueberries in a large bowl; add the sugar mixture to the blueberries. Gently combine all ingredients until they form a nice chunky thick blueberry paste. Pour the mixture into the prepared pie shell. Top pie with remaining dough. After the filling is in and the lattice top has been made, it’s time to make the egg wash. Just take one large egg and whisk it until smooth. Lightly brush the rim of the pastry shell with the egg wash until the entire crust has been covered. To give the dish a nice crunch on the crust, take ¼ cup sugar and mix it in a food processor with a handful of diced candied ginger (I typically get the ginger candy at the Nut Box in Chelsea Markets). Pulse until very small beads of ginger-sugar form and sprinkle them on top of the pie crust after applying the egg wash. Let the filled pie sit in the refrigerator for 30 minutes before placing in oven, this will help it to congeal. Time for things to finally heat up! Bake the pie for about 20 minutes and 400 degrees and then reduce the temperature to 350. Continue baking the pie for about 35-45 minutes or until the crust is a deep golden brown color and the juices are bubbling and thick. If the edges of the pie are browning too much during baking, cover with aluminum foil or a pie crust ring. Once the pie is cooked let it cool for several hours. Cut into slices and Eat it Up! I’m so happy to pass the Versatile Blogger award on to you. Congratulations, and thanks for being you…which is, simply wonderful.